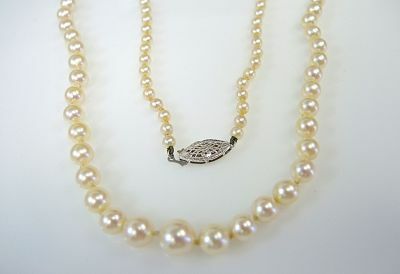 One graduated opera length pearl necklace containing 163 cultured pearls (3.5-7.75 mm). The pearls are of silvery creamy overtones and have good luster. The pearls are accompanied by a 14 kraat white gold filigree clasp. The necklace is approx. 35 inches (88.90cm) in length.